NEW DELHI/SINGAPORE (Reuters) – Indian airlines are turning to the international market in search of better returns as the intensifying fight for a bigger share of the world’s fastest growing domestic market – where price is king – drives down profits. While global airlines’ profits have been strong since 2015 – though with wide regional variations – Indian carriers are struggling to remain profitable, despite filling nearly 90 percent of their seats and benefiting from a more than doubling of domestic passenger numbers over the last four years. “It is an incredibly tough domestic market, very price sensitive,” said Stephen Barnes, chief financial officer of Singapore Airlines (SI:SIAL), which operates an Indian carrier, Vistara, in a joint venture with the Tata Group. India is one of the cheapest domestic airline markets in the world, with an average fare of 13 cents per kilometer flown, according to data from travel firm Rome2Rio, less than half the 27 cents per km average in China and the United States. Airlines including Vistara, SpiceJet Ltd (BO:SPJT) and InterGlobe Aviation Ltd’s (NS:INGL) IndiGo are in talks to buy or lease widebody aircraft as they firm up international growth plans to boost profitability. The international market is dominated by foreign carriers but the market share of Indian airlines including Air India and Jet Airways (NS:JET) has been climbing, helped by policies that limit access by foreign carriers, and reached about 38 percent in 2017, up from 31 percent a decade earlier. Foreign airlines such as Emirates and Hong Kong’s Cathay Pacific Airways (HK:0293) have reached the limit of flights into India allowed under bilateral agreements and New Delhi has not extended additional rights, creating an opening for domestic carriers to grow, said Binit Somaia, director for South Asia at CAPA. “Demand is there, income levels are rising and people want to travel internationally,” he said. Jet Airways is considering launching new flights from Mumbai to Sydney, two sources with knowledge of the matter said, while Vistara is planning to order six Boeing Co (N:BA) 787 aircraft and will expand its narrowbody fleet of Airbus (PA:AIR) A320neos as it starts international flights, sources have said. 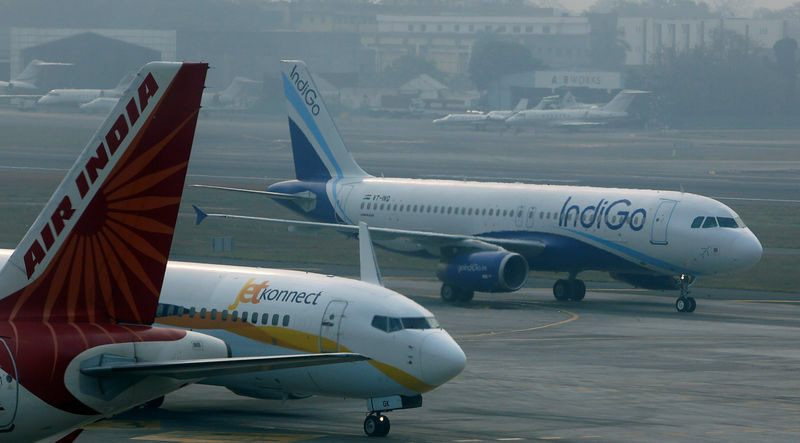 Revenue per available seat kilometre, a measure combining airfares and seats filled, has been falling at Indian airlines due to stiff competition at a time when the oil price has risen nearly 50 percent in the last year. IndiGo last month reported a steep fall in quarterly profit due to higher fuel prices and continued pressure on yields, a proxy for airfares. IndiGo has lifted the proportion of its capacity dedicated to international flights to 15 percent, from 11 percent, in the last year and is seeking regulatory approvals needed to operate long-haul flights, Rahul Bhatia, the company’s chairman, said during an analyst call. Analysts say it has achieved this by maximizing its aircraft utilization and also flying less competitive routes where it can have a better control over fares, helping protect yields. Infrastructure constraints at major Indian airports like Mumbai and Delhi, where daytime slots are hard to get, also make going international a better option as airlines can utilize night-time slots, a SpiceJet official told Reuters. “International is the only way out,” the official said.